â€‹Your holiday will consist of 2 magical nights sailing the Whitsundays on board one of the regions most stylish and deluxe catamarans. While onboard Whitsunday Getaway, you will visit Whitehaven Beach and Hill Inlet lookout as well as enjoying some snorkelling, sailing and exquisite food. But your luck won't stop there! You will then retreat to the amazing oasis of Hamilton Island's Palm Bunaglows for 2 nights of pure bliss. Hamilton Island is a world renowned island for its exclusivity, picture perfect setting in the Whitsundays and amazing amenities and establishments. While on Hamilton Island, fill your day with fun water sports or simply relax and just watch the world go by. 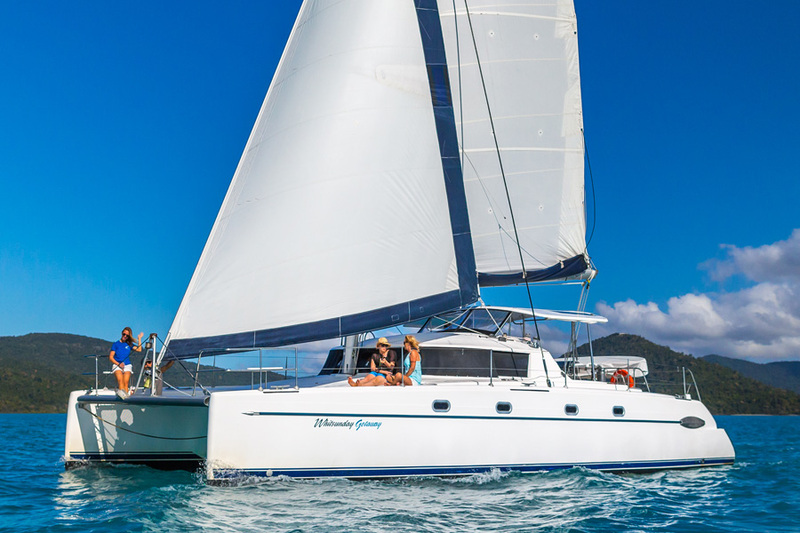 Whitsunday Getaway is the ideal way to immerse yourself in luxury and style on a sailing trip in the Whitsundays. Whitsunday Getaway offers a unique experience and is ideal for holiday-makers who enjoy exclusivity, low numbers and quality service all the way. This beautiful sailing catamaran has a flexible itinerary and each trip takes you to different locations with the passengers often choosing which destinations they would like to visit. Whitsunday Getaway is one of the most luxurious and comfortable catamarans in the Whitsundays. Cruise into paradise with all the comforts of home and dive into luxury one this romantic sailing escape. Hamilton Island Palm Bungalows are perfectly positioned between Catseye Beach and the Marina Village, which every bungalow featuring a furnished balcony and set in tropical landscaped gardens. The air-conditioned Palm Bungalows are serviced daily and only recently renovated so all with fresh decor and modern amenities. Surrounded by tropical landscaped gardens and Hamilton Islands lush foliage, the bungalows have everything you need for a comfortable island holiday. The bungalows offer seclusion in a convenient location, with the islands main swimming pool and shops and restaurants of Marina Village just minutes away. Please note: Peak season surcharges (Christmas and New Year) may apply. Boat - Please bring only a small soft bag with: change of clothes, hat, swim-wear, sunscreen 30+, warm pullover for the evenings (seasonal). You will also need to bring your own alcoholic beverages, available for purchase in town. No glass bottles please. Boat - Skipper, crew, drinking water, meals, linen, wetsuit hire, bath and beach towel, snorkelling equipment and all Marine Park fees. Boat - BYO alcohol - no glass bottles, with the exception of Wine and Champagne. Soft drinks available for purchase on board. An $18 surcharge may apply for some dietary requests and requirements. Peak season surcharges (Christmas and New Year) may apply. Accommodation - You will need to make own way to and from ferry terminals for ferry over to Hamilton Island Marina. Please make sure there 20 mins before ferry departure. Boat - All departures and itineraries are subject to weather. Tours may be changed or cancelled for any reason at the discretion of the Tour Operator. It should be noted that adventure travel involves risk. Whilst we make every effort to safeguard clients, we cannot be responsible for personal injury or loss due to actions of our clients which are beyond our control. We recommend that all clients have travel insurance covering illness, injury, loss or damage to personal belongings and not being able to travel on the confirmed date of departure. Please be aware operators pass on credit card merchant fees so there is a non-refundable 2.5% surcharge for VISA, MASTERCARD and AMEX card purchases. Accommodation - Rates quoted above are per room per night based on twin share, extra person rates apply and subject to availability. Blackout periods may apply. Kids Stay and Eat Free program: Kids 0 to 12 years stay free when sharing with parents and using existing bedding. Kids 0 to 12 years eat free when dining with parents at selected restaurant and choosing from the special kids menu. Please be aware operators pass on credit card merchant fees so there is a non-refundable 2.5% surcharge for VISA, MASTERCARD and AMEX card purchases. Boat - All client cancellations forfeit 25% of total ticket price and all client cancellations made less than 21 days prior to departure will result in complete forfeiture of the full price of the sailing holiday. If the sailing company has to cancel the trip (prior to the boat's departure) and we cannot offer a suitable alternative, then a refund will be given minus card fees. We strongly recommend that you have travel insurance, especially during the wet season. Accommodation - All cancellations will forfeit the deposit paid at time of booking. Your credit card details will be passed on to the accommodation to secure your booking. Any cancellations within 14 days will forfeit full amount. We strongly recommend that you have travel insurance.